"This dramatic increase from trends in the last decade will boost the likelihood of deforestation in protected areas in the upcoming year," said study co-author Laura C. Schneider, an associate professor in the Department of Geography at Rutgers University-New Brunswick. "The time for securing peace with the forest is now," concludes the study by scientists at Universidad Nacional de Colombia, Rutgers and Stony Brook University. The late 2016 peace agreement ended a decades-long struggle between the government and Fuerzas Armadas Revolucionarias de Colombia (FARC) guerrillas across Colombia's vast forested frontier. While armed conflict and its end can have major impacts on natural resources, the influence of war and peace on highly biodiverse tropical forests remains disputed. Understanding how the transition from war to peace affects forests is crucial to mitigating carbon emissions and biodiversity loss in Colombia and in other biodiversity-rich areas plagued by conflict worldwide. 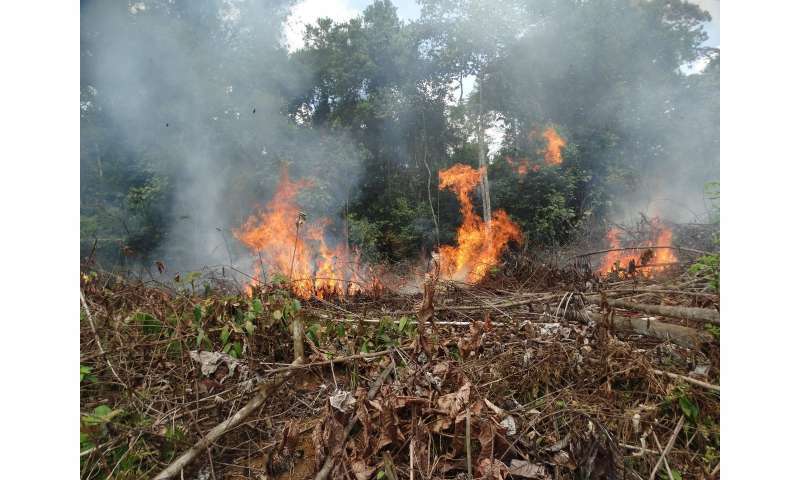 The researchers found a 600 percent increase in fires in protected areas across biodiversity hot spots following guerrilla demobilization in Colombia. They also calculated a 52 percent increase in the probability of deforestation within parks for 2018. While the peace agreement includes language on sustainable development, guerrillas often had their own forest conservation policies that they enforced episodically and at gunpoint, so they would not be spotted easily by government airplanes and helicopters. Conservation may have been incidental to the FARC's political and economic objectives at the forest frontier, but armed conflict that curbed the transformation of vast forests and deforestation hubs during peace were predicted, the study says. Since the Colombian government lacks environmental or other law enforcement capacity at the frontier, enforcement is now up for grabs by small landholders, ranchers, land speculators, drug traffickers and others. The peace agreement promised land titles to former combatants, especially in areas controlled by guerrillas, including several protected areas. Demobilization can make the land accessible for cultivation and pasturing by former combatants who know the region and newcomers waiting to cash in on newly accessible land.